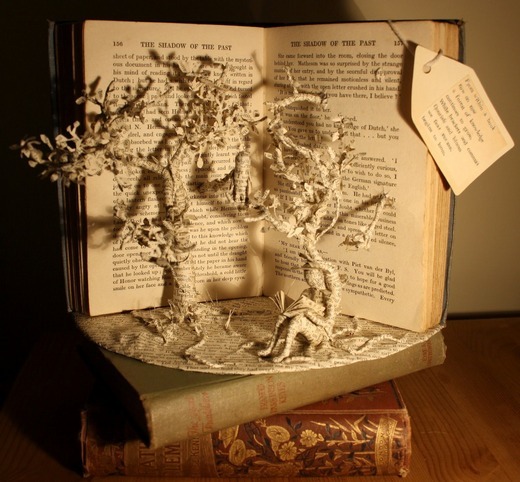 You might know Emma Taylor’s book sculptures. They are lovely creations: intricate, serene, and alive. Her work is reminiscent of the anonymous book art that began appearing in Edinburgh a few years ago, but the identity of the latter remains unknown. To me the possibility of the end of the book is a tragic one; I appreciate books as an object as much as I enjoy the stories and knowledge which they hold. This appreciation surely grows in those exposed to her art: think how a beginning reader with their first library card would react upon seeing these miniature worlds that seem to grow out of the very pages of each book, the text embodied in a study of itself. As a child I adored ‘make and do’, tugging and taping paper into all sorts of three-dimensional entities – all quite crude and disposable, but transporting nonetheless. Peggy Nelson, in her analysis of pop-up books, put it nicely: “we were not content with surfaces”. This entry was posted on Tuesday, June 10th, 2014 at 10:01 pm and is filed under art, books, film. You can follow any responses to this entry through the RSS 2.0 feed. You can leave a response, or trackback from your own site. Re Book Sculptures 2013, 0:38: Must be a copy of The Third Policeman. No doubt, these bicycles will get confiscated by Sergeant Pluck. Sean: And the molecules of the book are gradually becoming the molecules of the bicycles. Howdy — I sent this post to an artist friend, and now he and I want to know if “make and do” corresponds to US “arts and crafts”, or maybe more like DIY? Any idea? Thanks! Hi Anne, yes, make and do is the same as arts and crafts. I put the phrase in quotation marks above because I wasn’t sure how widely used it was. It was the usual term I heard as a child, on Irish children’s TV and in school, etc. Later I learned arts and crafts as the more standard phrase.